With the optimized antennas built-in, DrayTek Vigor AP910C ceiling-mount wireless access point is ideal for hospitalities, small offices and small campus. The Vigor AP 910C is IEEE 802.11ac compliant and supports multiple operating modes, such as wireless access point, wireless client, wireless distribution system (WDS) and universal repeater. 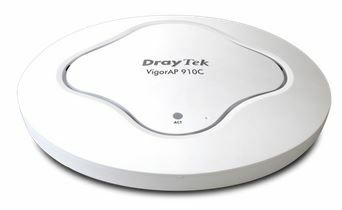 The Vigor AP910 C makes high density with quality-performance be feasible for users as it is going to be implemented with DrayTek central wireless management (AP Management) supports configuration, firmware upgrade, status, monitoring, and load-balancing. The benefits of central wireless management ( AP Management) The VigorAP 910C can operate in standalone mode for your office network or a classroom; connected to your LAN and offering you with wireless access. If your network requires several VigorAP 910C units, to centrally manage and monitor them individually as a group will be expected. DrayTek central wireless management (AP Management) lets control, efficiency, monitoring and security of your company-wide wireless access easier be managed. Inside the web user interface, we call “central wireless management” as AP Management which supports mobility, client monitoring/reporting and load-balancing to multiple APs. For central wireless management, you will need a Vigor2860 or Vigor2925 series router; there is no per-node licensing or subscription required. With the unified user interface of Vigor2860 Combo WAN series and Vigor2925 Triple WAN series, the multiple deployment of VigorAP 910C can be clear at the first sight. For multiple wireless clients, to apply the AP Load Balancing to the multiple APs will manage wireless traffic with smooth flow and enhanced efficiency. PoE for easy installation The Power of Ethernet (PoE) on VigorAP 910 C relieves the installation of power plug. The massive deployment of VigorAP 910C for hospitalities and school environment will be much easier.